The old bazaar gathers both local residents, doing their daily shopping, and numerous tourists exploring the city. As the first market built in Korçë, at the end of the 19th century, it is of great historical and monumental value. The complex preserves old buildings and parts of the city made of stone, making the visit to the bazaar an aesthetically pleasing experience. The old bazaar unites the open-air market with workshops or small commercial units, and intimate guesthouse which still preserves the city’s culinary and hosting traditions. This is the best place in town to buy souvenirs of all kinds! You can find objects ranging from traditional craftsmanship to the agro-food products of the area. The shops are housed within two-story traditional houses which reflect the city’s history. In fact, their recent reconstruction is in perfect harmony with the square’s existing architecture. The exciting new additions around the bazaar are bars and restaurants. In addition to their traditional yet contemporary atmospheres, they serve the city’s famous cuisine under the sounds of live music throughout the year. 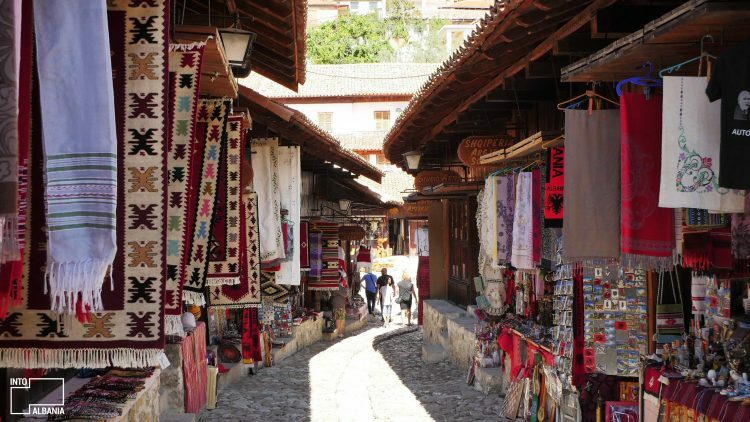 This bazaar is one of the oldest in Albania! 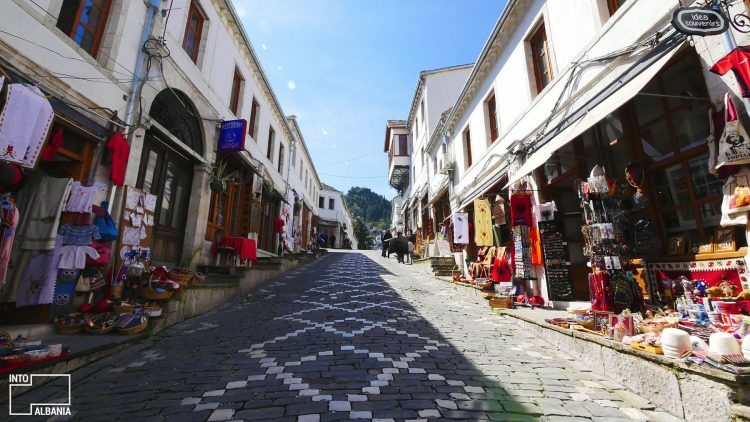 The construction of the beautiful and rich bazaar of Krujë dates back to over 400 years ago. It was the starting point of free trade among the city’s best merchants. It is in this particular bazaar that they began to officially exchange various kinds of goods with one another. Conveniently located on the main road leading to the Castle of Krujë, the space is part of the museum while also satisfying a commercial need. Whether you need a traditionally-crafted rug or masterfully made copper products from the renowned craftsmen, you can find it all here! Other objects include genuine handcrafted items and silver jewelry that can last a lifetime. The bazaar has grown over the centuries, dictating the spread of housing and urban structures around it. It is indeed Kruja’s epicenter! Built more than 500 years ago, the bazaar is one of eight oldest districts of Gjirokastër, stretching like a beam below the castle walls! It remains in constant reconstruction due to its age and monumental status as a UNESCO national and world heritage site. The bazaar is actually mentioned in several travel journals and documents of the Middle Ages. The bazaar’s life began within the walls of the castle, which used to surround the city of Gjirokastër. With an increase in population, however, families ventured out and began laying the first foundations of commercial constructions outside of the castle walls. The neighborhood, called Qafa e Pazarit (Bazaar’s Pass), is one of the most recognizable in the “city made of stone.” It is annually visited by thousands of foreign tourists. Here, they find some of their best-handcrafted travel mementos in wood, stone, and fabric, handmade by true masters in this place. 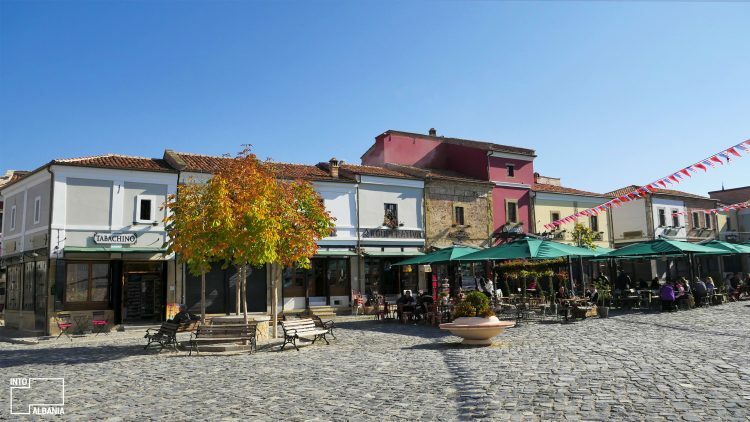 Facades of the surrounding houses offer an aesthetically interesting view of the medieval buildings, while the shops spread throughout the bazaar way provide a variety of objects, facilities and services. The characteristic cobblestone is one of the most beautiful elements of this bazaar. The area has recently been enriched by newly excavated ruins!